At the banks of the Mekong River in Thailand's very north is Chiang Saen placed, one of the oldest cities of Thailand and, besides, defenitely one of the remarkable places in this country. It's part of Chiang Rai Province, who covers large parts of north Thailand. Only few tourists come here, because it's at a dead end, not on the way to anywhere. The surrounding Golden Triangle (as the geographical point, where the three countries Thailand, Laos and Burma/Myanmar touch each other, in distinction to the Greater Golden Triangle area, which is much bigger) is a booming area itself, attracting gamblers in a new, Chinese run casino on one of the islands in the Mekong River, which belongs to Laos. While at the river banks here is some activity of border crossing for local people and loading and unloading boats who go and come with goods from and to China, the inner city is widely quiet. Not all of the large area within the old city walls is inhabited, what indicates that the place was once maybe housing more people than it does today. Now, since the whole world region is economically booming, building activities and urbanisation is rampant. The roads between Chiang Saen and the neighbouring places Chiang Khong, Mae Sai and Mae Chan are dotted with building sites and new buildings, bigger and smaller ones. 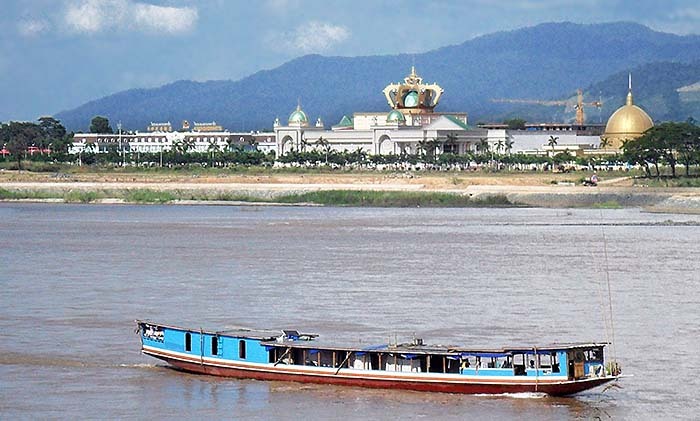 A new, big road connects Chiang Saen now with Mae Chan, and a brandnew bigger river port at the Mekong River, some five kilometers east of Chiang Saen, will soon be an important hub for the import of Chinese goods. 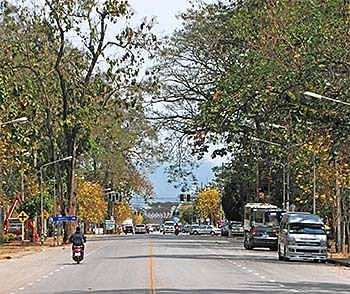 Chiang Saen also got a new ringroad for bypassing traffic, surrounding the city in a big bow. As I read in early January 2016 in the Bangkok Post, the nice road between Chiang Saen and Chiang Khong is undergoing massive expansion and will soon be a four lane highway. Close to the new port the Kok River (Nam Kok), coming from Tha Ton via Chiang Rai joines the Mekong River. 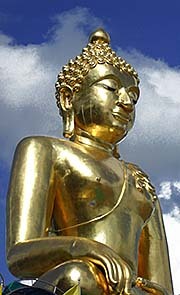 Chiang Rai is some sixty kilometers southwest of Chiang Saen. There are traces of prehistorical inhabitants of the place. Evidences of that are to see in the National Museum of Chiang Saen. It's, by the way, the same game here as it is always: foreigners pay five times the price (100 baht) as Thai People do (20 baht). The founding dates of Chiang Saen are contradictory. It's predecessor was Ngoen Yang, a town which was not situated at exactly the same place as Chiang Saen is today. Ngoen Yang was probably destroyed by an earthquake which caused a significant change of the landscapes around. There are still sometimes earthquakes in the region, with their epicenter in the Shan State of Burma/Myanmar, who cause great damage and kill people. One of the princes of Ngoen Yang was Mangrai (1238 - 1317 CE), who founded the kingdom of Lanna and also the two cities Chiang Rai (1262 CE) and Chiang Mai (1296 CE). Chiang Rai became the first capital of Lanna, but Mangrai moved it later to Chiang Mai which gained more importance afterwards. 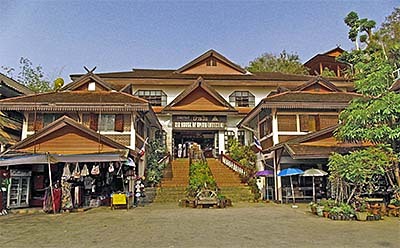 The town of Chiang Saen at the place where it is nowadays has been founded in 1329 CE by Saen Phu, a grandson of Mangrai. The medieval Chiang Saen was protected by a city wall from three sides around, while the fourth side was covered by the Mekong River. The city wall with the moat is still existing and since at least two years under restoration (seen at the time of early 2013); the restauration process takes a long time. Nevertheless, there is progress, and after cleaning the old remains, a process of building up parts of the walls in the former shape is going on. Of the old five city gates there is only one half-restaurated (Pratu Chiang Saen), which is on the road to Mae Chan. 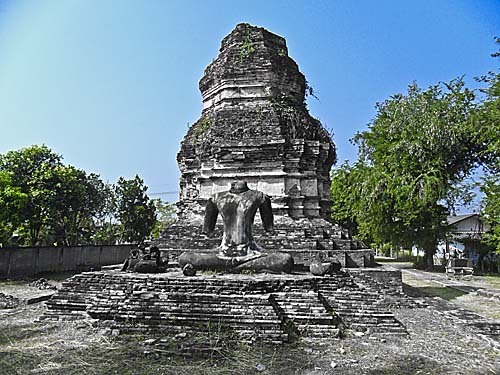 When Lanna came under Burmese occupation (from the 1558 on), Chiang Saen was a Burmese stronghold; over a longer time there were Burmese noblemen in the city, ruling from here. In the 18th century, the place was an important regional political and military center. In the decades around 1800, due to endless wars between Lannanese people and Siamese on one side and Burmese on the other, Chiang Saen became completely abandoned and was very slowly resettled from the late 19th century on. Whole Lanna was so havoced, that it occured that tigers entered the small towns from dusk on. 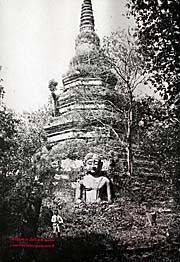 Chiang Saen came as late as 1804 under Siamese control, after a military conquest of king Rama I's troops in alliance with the king of Chiang Mai and a lord of Nan. The Siamese king ordered the destruction of the town with the exception of the religious sites. 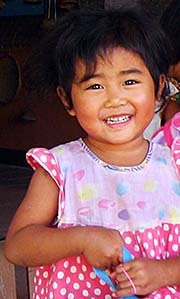 The inhabitants were under force resettled into Ratchaburi Province and Saraburi, central Thailand. In 1881 the refoundation of Chiang Saen happened, and settlers from Chiang Mai, Lampang and Lamphun immigrated. In 1905 there were only 70 people living in Chiang Saen. 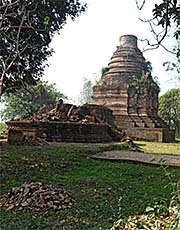 The oldest ruins of nowadays Chiang Saen date back only to the time of king Mangrai. 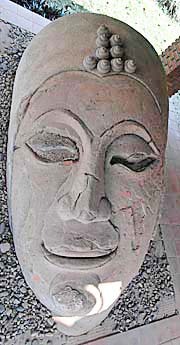 The conservation of Chiang Saen's monuments is ongoing since 1957. In 1987 the management plan of restauration was reformed under the label of 'The Conservation of the Historic City of Chiang Saen'. It's planned to conserve the entire area of the historic city and to gain the status of a UNESCO World Heritage. The restauration shows effect, for many of the old sites are in a quite good shape and it's a pleasure to walk through the city and to see a great number of ancient sites scattered all over the place. Since two years I observe the restauration of the city walls what made progress in the recent months. 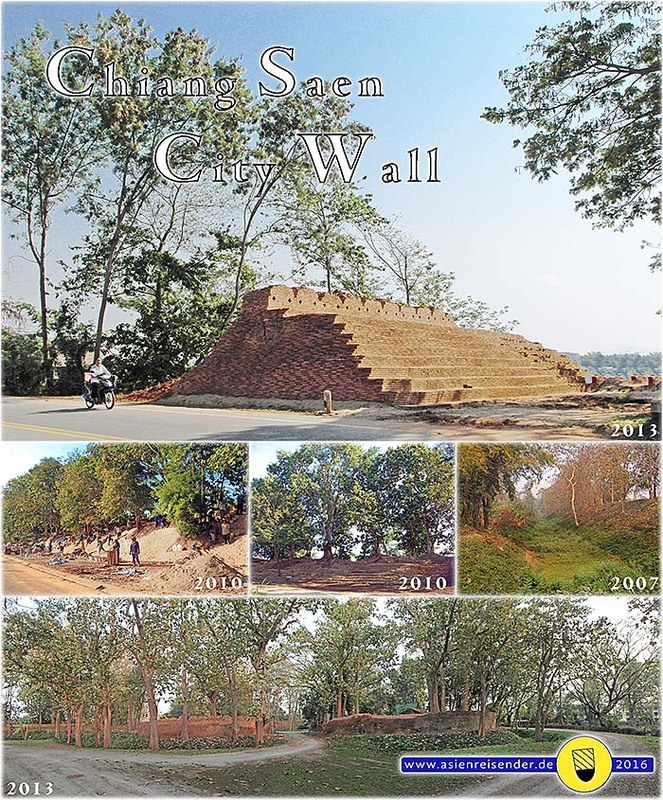 The city wall of Chiang Saen was under restoration in the last years. 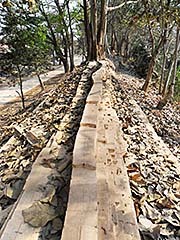 The first photo shows the piece at the northern gate with the road towards Mae Sai. The image bottom shows Pasak Gate. 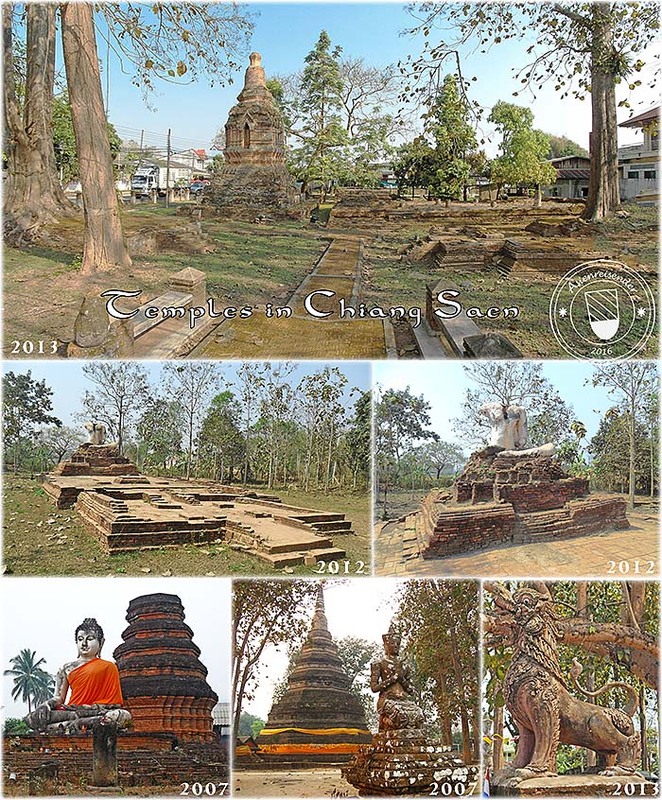 Old chronicles mention 139 temples of Chiang Saen. Whithin the city walls are the remains of 76 ancient temples, outside are another 63. Many of them are pretty much down. Others are impressive and partially restorated. Simply a longer walk through the city is revealing much of it's treasures. Just to mention a few names, there are Wat Chetawan, Wat Phra That Chao Lan Thong, Wat Phra Yuen and a number of smaller, on the first glance (yet, since they are not restored) less impressive temple remains scattered within the city walls. As always in Southeast Asia, the houses of the people were built of wood (the better ones with teak) and are gone. Remaining buildings (built in stone) are always only religious buildings. 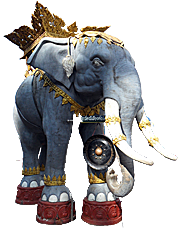 Outside the ancient city walls are numerous more sights, particularly on the roadside of the road to Chiang Khong. Wat Phra That Chom Kitti is on top of a hill a bit outside of the city walls and less ancient (unknown age). 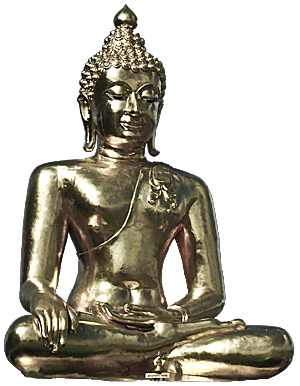 Wat Phra That Pha Ngao is located on the top of a mountain outside of the city. From there one has a majestic view over the Mekong River and the landscapes inside Laos. One of the, if not the most attracting sight of Chiang Saen is Wat Pa Sak (the teak forest monastery), an ancient Lannanese temple a stonethrow outside the ancient city walls near Chiang Saen's Pasak Gate. Built either from 1255 CE or, according to other sources, from 1319 CE on and including 22 historic remains on the temple ground, it represents a sophisticated piece of Lannanese architectural style. 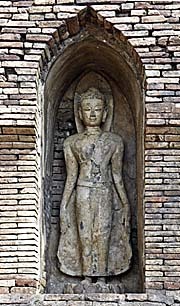 The main chedi (stupa) is the most impressive building with a number of sculptures. 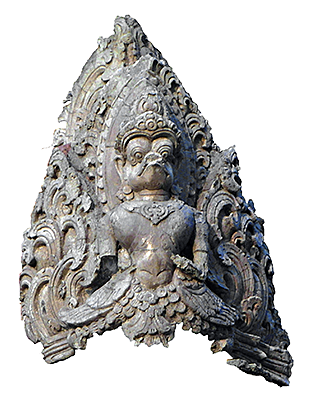 The origins of Hariphunchai (see also: The Dvaravati Culture), Sukothai and Pagan (Burmese) architecture are still recognizable. Another impressive and at least bigger sight is Wat Phra That Chedi Luang, near the national museum. It's 58 meters high, dating from 1331 CE and enlarged in 1515 CE, and is in good condition. 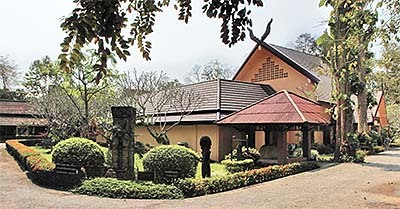 The national museum houses a small collection of Buddha statues in Chiang Saen style. At the National Museum we are again confronted with the fact that foreigners pay five times the price (100 baht) as Thai People (20 baht) do. A few kilometers out of Chiang Saen, behind the Golden Triangle left to the road to Mae Sai, there is an Opium Museum placed. There is another kind of museum directly in Sop Ruak, the place at the Golden Triangle, what is called the 'Hall of Opium'. Wat Pa Sak, the teak of forest temple, placed closely outside the old city walls near Pasak Gate, is probably the 'best' sight of Chiang Saen. In parts it's nicely restorated and the surrounding are clean and for a larger park. Few visitors come here. There is a small ticket booth where an entrance fee is charged. 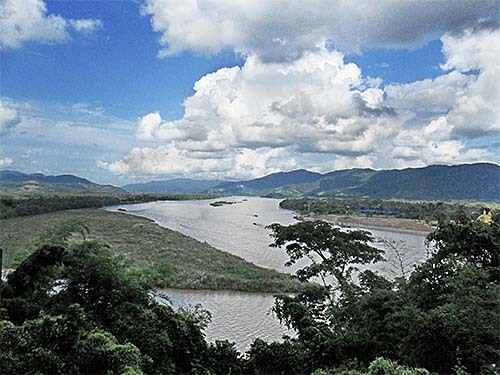 Close west to Chiang Saen are the Chiang Saen Lakes, a wetland area of freshwater lakes, swamps, woodland, bushland, canals and reedgrass areas. It's hosting a great number of animals, particularly bird species, part of them are coming here in wintertime from Siberia. 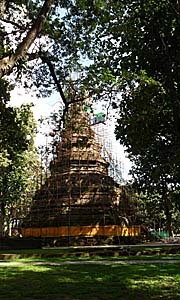 Efforts have been made for the landscape's protection. 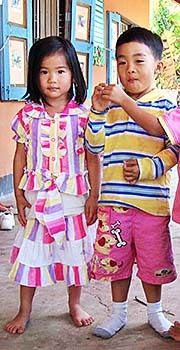 That's not an easy task, because there is little understanding in the local population for environmental protection. The local people are used to take from the nature what they need, be it wood, stone, water or hunting animals. In reverse they drop their litter everywhere. Not seldom I see peasants with primitive shotguns (18th century kind) entering the forests for hunting their dinner. Many birds are victims of hunting activities. Many animals also die in old, forgotten nets, for the locals never remove things they don't need anymore. They have little capability and no will to consider the consequences of their behaviour. Reportetly organized gangs from outside come and do a kind of 'dynamite fishing', using explosives to get as much fish as possible. No need to add that this practice causes a severe damage to the fish grounds, destroying the breed, nests, hideouts and food resources of the animals in the water. Additionally, I don't think that the officials here take environmental protection much more serious than the average local. The notorious and omnipresent traffic is another problem. The area is divided by roads, one of them the huge new highway between Chiang Saen and Mae Chan, which many animals have to cross. That means habitate fragmentation. The highly beloved cars cause huge losses of animal lifes. That all led to a severe reduction of the abundance of wildlife here. And it's, of course, an ongoing process. 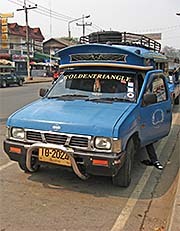 Traffic is highly on the rise in Thailand as in whole Southeast Asia. Nevertheless, there are people fighting for the nature and it's wildlife. For more information on this have a look for the website of the Yonok Wetland Project. 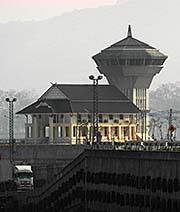 The Golden Triangle is a region around the spot where Thailand, Laos and Burma/Myanmar have a common three-country border point. 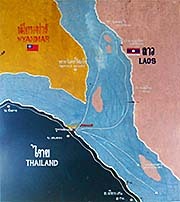 That is geographically exactly at the confluence of the Ruak River (Nam Ruak) and the Mekong River. It's seven kilometers north of Chiang Saen. Althought the region called the 'Golden Triangle' is much, much bigger, the Thai tourist industries promote the three-country spot on the Thai side as the Golden Triangle (Sop Ruak). 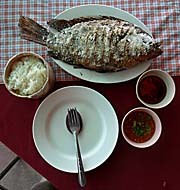 Sop Ruak is a new, small town booming on the roadside of the road between Chiang Saen and Mae Sai. The attraction here is a big, golden Buddha, a view point up on a hill (from where one can see at clear days allegedly up as far as to China), an old temple and, above all, a kind of ever-running fair at the river banks for the common, immature tourists. For the Asian tourists is above all the Chinese casino on the Laotion side of the Mekong River most interesting. Since gambling is prohibited in Thailand, the Thai gamblers have to go to neighbouring countries to try their luck there. 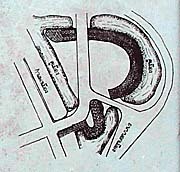 The name of the spot respectively area derives certainly first of the gold with which Chinese traders paid for the drug in former times and second of the triangle-shape of the spot at the confluence of the two rivers. The Greater Golden Triangle is the area which covers all the space in which opium was or is produced. That includes large parts of north Thailand, north Laos (see also: Muang Sing), even parts of north Vietnam, parts of south China (Yunnan) and the neighbouring part of Burma/Myanmar, what is the Shan State in this country. A center of opium production in past decades was the area around Mae Salong. The Golden Triangle is actually synonymious with drug production, namely opium and it's derivate heroin. 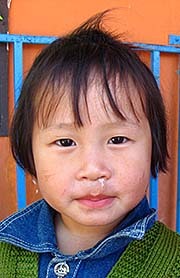 Opium is traditionally cultivated by some of the hill tribes who immigrated in former times into the area from Yunnan. Using opium, particularly smoking it, was always a common thing among these people. In colonial times, the western powers promoted the opium trade, which was one of their revenues. In the 1950s, when China and Persia suppressed opium production in these countries, the Golden Triangle filled the gap on the world market. In the following years, the CIA promoted opium and heroin production particularly in Laos for gaining money for financing the secret war, employing tribal people like the Hmong for their martial purposes. The Americans had access to production of the drug and they opened a distribution network which targeted the western countries, above all the USA. 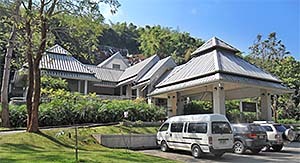 Short behind the three-country point on the way to Mae Sai is also the 'Hall of Opium', the famous Opium museum, placed. Since Opium production in Thailand seems to have ceased completely (has it?! ), the Shan states in neighbouring Burma/Myanmar are still the second biggest opium producing area in the world (topped only by Afghanistan). As it is all too often in highly corrupt dictatorships, the Burmese army is very much involved in drug production. A US investigation claims that the profits are as high as several hundred million dollars who are piled up in Singaporean banks, and that any economic activity in Burma/Myanmar is irrigated by drug money. In recent decades, a new branch of drug production evolved particularly in Burma/Myanmar - that is that of metamphetamines like 'yaba' and 'ice'. From here the drugs are distributed all over Southeast Asia and also into the western world. Besides, there is another three-country border point north of the Golden Triangle, where China, Laos and Burma/Myanmar touch each other (called the 'Green Triangle').